NJDEP Office of Sustainability. Check out the S3 Flyer to learn more about the program. Join the group of over 600 business leaders who have attended meetings to learn about, improve, and encourage the growth of sustainability in New Jersey! Each S3 meeting has a unique sustainability related theme, and features presentations from experts and NJ leaders. Below you will find a brief description of each event, with supporting materials. 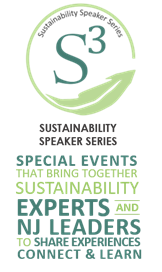 The Sustainability Speaker Series was developed by the NJ Department of Environmental Protection, Bureau of Energy and Sustainability’s, Sustainable Business Initiative (SBI). The SBI was launched in 2011 and brought together representatives from State government, business and non-profit sectors to brainstorm and implement programs to encourage sustainability within the state. Through the efforts of the SBI Stakeholder Committees, two programs were developed, the Sustainability Speaker Series, and the NJ Sustainable Business Registry. At this time, the SBI Stakeholder Committees are no longer active. Read this to earn more about the history of the SBI. Check out our Sustainable Business Guides to learn how you can incorporate sustainable practices into your business operations. On March 20, 2019 Sustainable Business Registry member, River Horse Brewing Company, hosted a NJDEP Sustainability Speaker Series (S3) Meeting. At the meeting, River Horse Owner, Chris Walsh, talked about how sustainable operation is smart operation and how the green choices he makes for the brewery keep it profitable. To learn more about River Horse’s sustainable actions, visit their Registry profile here: http://registry.njsbdc.com/business-profile/381/376/river-horse-brewing-company. We also had Operations Manager and Brewer, Sean McClurg, take us on a tour of River Horse’s brewing process. Following the River Horse Presentation and Tour we heard from guest speaker Elliott Ruga, Policy Director of the NJ Highlands Coalition. Elliott discussed the importance of preservation in the Highlands and how protecting natural assets mitigates climate impacts. On September 21, 2018 Humanscale hosted a Sustainability Speaker Series (S3) tour at their manufacturing plant in Piscataway, New Jersey. Humanscale is a global manufacturing company that specializes in designing ergonomic products, with sustainability being part of their design, materials and practice. The Piscataway manufacturing plant is Humanscale’s largest location, a Sustainable Business Registry member and a 2017 NJDEP Recycling Award recipient. Luke Zhou, Lead Sustainability Materials Specialist at Humanscale discussed the importance of having a clean supply chain for their products to achieve overall sustainability. Most products are made in shop and parts that they need to order are custom made, ensuring no carcinogens or pollutants in materials. Alexander Tselepis, Sustainability Coordinator, lead the tour which included a review of Humanscale’s products, production and quality control operations. The June 19, 2018 S3 meeting, held at Campbell Soup Company in Camden, NJ, focused on the sustainability efforts of Campbell’s and Camden County. Dave Stangis, Vice President of Corporate Responsibility at Campbell Soup Company, discussed Campbell’s Sustainability Vision to build a more resilient food system and its mission to lead the industry in food that is ethically and sustainably grown, sourced, produced and shared. Following Dave’s presentation, Mike Downs, Environmental Health and Safety Specialist at Campbell’s, spoke about Campbell’s goal development and waste reduction targets, data analytics and tracking, and its waste programs execution. Melissa Donnelly, Senior Manager Global Supply Chain Sustainability at Campbell’s, expanded on Campbell’s waste reduction targets focusing specifically on what Campbell’s has done to minimize its food waste entering landfills. Finally, Chris Waldron, Director of Sustainability and Shared Services for Camden County, discussed the sustainability plans for Sustainable Camden County and highlighted some of the County’s most notable contributions to sustainability— like the City of Camden being the first municipality in the State to pass a Sustainability Ordinance. 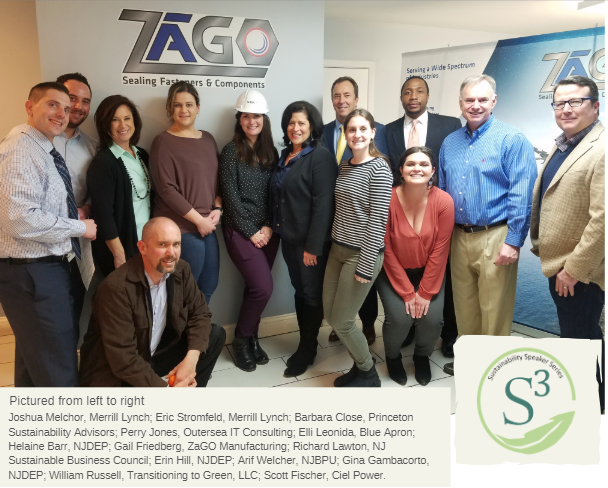 On February 22, 2018 Earth Friendly Products hosted a Sustainability Speaker Series (S3) tour at their manufacturing plant in Parsippany, NJ. Earth Friendly Products creates household cleaning products that are derived from renewable resources and plant-base materials. Not only are their products sustainable, but their facilities are too. April Ensinger, Technical Director at Earth Friendly Products shared what it is like to run a sustainable operation from the inside out. The tour included a review of Earth Friendly’s production, assembly and packaging process, recycling efforts and quality control operations. The October 5, 2017 S3 meeting introduced the shift from SBI—S3 and focused on how large organizations with substantial market power can influence the market to adopt more sustainable practices. Kyle Tafuri, Director of Sustainability for Hackensack Meridian Health, discussed how Hackensack University Medical Center spread out their sustainability practices throughout their entire network and how they are raising the bar for sustainability in health care. Additionally, summer interns from the PSEG Institute for Sustainability Studies discussed their work with employee engagement at Hackensack UMC. The April 4, 2017 SBI meeting focused costal business resiliency and risk reduction strategies. Prior to the meeting there was a tour of NJM’s Hammonton facility lead by Greg Iorio. The meeting featured three presentations, the first by Patrick Kobol, Workforce Administrator at NJM Insurance Group; the second by Geoffrey M. Goll, Vice President and Principal Engineer at Princeton Hydro; and the third by Raghuveer Vinukollu, Property Reinsurance Underwriter at Swiss Reinsurance America Corporation. The presentations were followed by a panel discussion featuring Pat, Geoff, and Raghuveer, and moderated by Anne-Marie Peracchio, Director of Conservation and Clean Energy Policy at New Jersey Natural Gas. The September 29, 2016 SBI meeting focused on leveraging sustainability as a strategy for businesses to attract, engage, and retain their workforce. The meeting featured two presentations, the first by Nick Lange, a Senior Consultant at Vermont Energy Investment Corporation, and the second by John Queenan, Senior Director of Global CSR and Sustainability at ADP. This was followed by a panel discussion on the impact of sustainability on employees, obstacles to employee engagement, and lessons learned featuring Nick, John, and Nicole Dubé, Outreach Coordinator in the Ombudsman Office at the New Jersey Board of Public Utilities, and moderated by Kris Kohl, Principal of Becoming Sustainable (formerly HRComputes). The April 20, 2016 SBI meeting started with a presentation by Christina Simon, Corporate Program Manager of Global Supply Chain Operations at Lockheed Martin. This was followed by a panel of green procurement professionals from the public, private, and school sectors, including Kevin Lyons, Associate Professor in the Department of Supply Chain Management and Marketing Sciences at Rutgers, Michael Rosen, CEO of Commercial Cleaning Corporation, and Corey Lowell, Business Administrator of the Keansburg School District. They discussed the benefits and challenges of incorporating green purchasing into their supply chains. The meeting was followed by a tour of the Shore Point Distributing Company’s natural gas fueling station. The November 20, 2015 SBI meeting started with a presentation by Michele Siekerka, President & CEO of the New Jersey Business and Industry Association (NJBIA). This was followed by a panel of sustainable business practitioners, including Eric Dziedzic, President of CRx Solutions, Erol Odabasi, Director, Medical Device Sustainability at Johnson & Johnson, and Dan Josephs, Executive Vice President / COO of Spruce Industries, Inc. They addressed the question everyone asks when it comes to sustainability! How does sustainability increase my business’ profits? The June 16, 2015 SBI meeting started with a presentation by Clare Lumkong, Environmental and Sustainability Manager with Bristol-Myers Squibb (BMS). BMS just received the Energy Star Partner of the Year Award for 2015. Clare discussed BMS’s Sustainability Initiatives, including their energy efficiency accomplishments. Our second speaker, James Friedl with TRC, introduced us to the Business Energy Advisor, a new tool developed for the NJ Clean Energy Program. The Business Energy Advisor is hosted by E Source, and is a web-based library of energy efficiency advice tailored to the needs of business customers. The November 14, 2014 SBI meeting was a joint meeting with the NJ Clean Air Council focusing on how to promote electric vehicle workplace charging. The meeting started with a presentation by Chuck Feinberg, Chairman and President of the NJ Clean Cities Coalition. This was followed by a discussion on the topic. The October 31, 2014 SBI meeting focused on what Hospitals can do to become sustainable. Participants learned about the Healthier Hospital Initiative and Practice Greenhealth programs. NJ hospital representatives shared their stories about how they reduce waste and save energy and the final presenter introduced us to the new NJ Energy Resilience Bank. The June 17, 2014 SBI meeting included two speakers and a panel discussion. The meeting started with a presentation by Natalie Teear from PricewaterhouseCoopers who talked about the Dow Jones Sustainability. She was followed by Gregory Butler from Becton Dickinson who discussed how to create an effective sustainable supply chain. Barry Dambach from Alcatel-Lucent joined them at the end for a panel discussion where they answered questions from the audience. The February 4, 2014 SBI meeting included a presentation by Jeana Wirtenberg, author of Building a Culture for Sustainability - People, Planet, and Profits in a New Green Economy. She summarized never-before-published stories and lessons learned from nine successful global companies that have headquarters or major operations in NJ. In addition, Robert Coleman, Senior Manager of the Office of Sustainable Development, from Church & Dwight and Barry Dambach, Sr. Director of Sustainability and EHS, from Alcatel-Lucent shared their best practices.